(left) Lau Ching-Wan, and (right) Daniel Wu and Louis Koo eavesdrop in Overheard. The Skinny: A solid, entertaining and mostly well-cast thriller from some of those Infernal Affairs guys, Overheard manages tension and some surprise - even if it was approved by China. A massive improvement over Alan Mak and Felix Chong's last film, Lady Cop and Papa Crook. Featuring one of the worst and also funniest performances of the year from Michael Wong. by Kozo: Writer-director pair Alan Mak and Felix Chong have improved...at getting along with China. Their last film, Lady Cop and Papa Crook, was famously delayed for six months because it couldn't gain approval from Chinese censors, and the resulting film was bewildering, schizophrenic and an unqualified disappointment. The duo’s new thriller, Overheard, could have had similar issues, as is it concerns a trio of cops (Lau Ching-Wan, Daniel Wu, Louis Koo) who embark on a deepening series of crimes. Despite being fundamentally decent men, the cops should be punished according to the usual "someone must pay" rules outlined by SARFT (State Administration of Radio, Film and Television). Not to give Overheard away, but any and all wrongdoers in the film do somehow pay. However, even with that restrictive framework, Mak and Chong deliver tension and even some surprise, and Overheard manages to entertain if not completely impress. 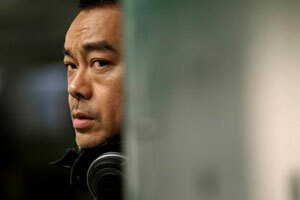 And anyway, they hit a home run by casting Michael Wong. More on that later. Johnny (Lau Ching-Wan), Gene (Louis Koo) and Max (Daniel Wu) are three cops working for the CCB (Commercial Crime Bureau), yet another one of Hong Kong's numerous law enforcement acronyms. They're part of a special team tasked with spying on business firm E&T, who may be guilty of illegal stock fixing as well as general sliminess. The cops conduct their investigation by placing hidden cameras and microphones in the E&T offices, plus they can also eavesdrop on E&T execs through their powered-on, but not engaged mobile phones. The job has its voyeuristic bonuses; besides peeping at sleazy executive Mr. Low (Waise Lee) ravishing his mistress (Queenie Chu), the guys can also spy on the soap opera shenanigans of their fellow cops (Sun Boy'z member William Chan and Sharon Luk) by tapping into their phones. Also, if they're smart, the cops can pick up tips on E&T's illegal stock fixing, erase the offending recordings and then cash in with some off-hours stock trading. Of course, doing so is totally unethical, and would be a bad move for anyone who claims to be a law enforcer – like our three heroes. Then again, if our protagonists didn't partake in a little corruption then there wouldn't be a movie. Besides, the men have their reasons – for starters, Gene's son suffers from cancer, and Gene himself has a terminal disease and will die in approximately a year. Already low on cash, Gene wants to leave his family with enough money after he's gone. Max is about to marry into money, but his feelings of inadequacy prompt him make his own fortune – illegal though it may be. Johnny is the lone holdout, a righteous cop who nevertheless has his own moral quandary; he's dating Mandy (Zhang Jingchu), the estranged wife of his cop buddy Kelvin (Alex Fong Chung-Sun). Johnny understands the conflicted emotions and even the shame involved in lying to your friends and co-workers, and despite trying to maintain a strong resolve, he can't bring himself to rat on either Gene or Max. Ultimately, he turns somewhat of a blind eye. That is, until the scheme spirals completely out of control, threatening the lives of E&T execs, the careers of the three cops, and perhaps their own lives, too. How bad will these good cops go to save their own skins? The answer: far enough. 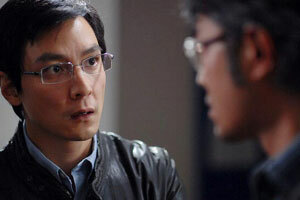 Once the bad circumstances start piling up, the three cops find themselves over their heads, and Mak and Chong manage some solid tension from the characters' increasing conflict. Part of the tension derives from wondering just what they'll do, and the guys are likable enough that one may even root for them to get away with their crimes. However, a lot of that sympathy also comes from the film’s headlining stars. Overheard is exceptionally well-cast. Daniel Wu perfectly embodies the naïve younger cop while Louis Koo plays to his acting strengths as the harried, nervous and desperate member of the trio. Lau Ching-Wan anchors the whole film, bringing a righteous presence as well as an opacity that makes him both dangerous and compelling. The supporting performances are strong too, from Lam Ka-Wah as the all-business superior officer to Zhang Jingchu in a small, yet solid turn as the woman in the middle. Technical credits are terrific, with only Chan Kwong-Wing's score sometimes going a mite overboard. There are debits concerning awkward exposition and pacing, but overall this is a solid, professional production. Well, almost. Mak and Chong have cast a lot of interesting faces in smaller roles, including a number of TVB stars, but one casting decision was balls-to-the-wall insane. The powers that be cast none other than Michael Fitzgerald Wong as Mr. Ma, the evil executive masterminding all the bad business shenanigans. Wong is physically good in the part, his newfound middle age giving him an appropriately oily heft. However, he blows the rest; his performance is a clinic of bad acting that makes portions of Overheard into high comedy. As usual, Wong alternates Cantonese sentences with English ones, delivering scene-chewing dialogue that’s so out of place that one wonders if he didn’t write it himself. He also explodes in anger like a spoiled kid denied a new toy, and at one moment even shrieks in terror like a little girl. It’s a terrible performance, but still very entertaining, as it gives Overheard a watchable, B-movie vibe that makes the film strangely more fun than it might have been. With Wong it’s harder to take the film seriously, but without him? Who knows, the film could have been a whole lot more boring.